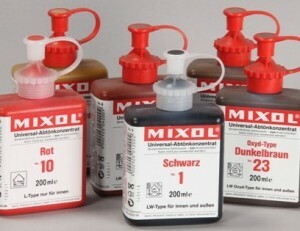 MIXOL colors are truly “universal” colors in that they use no binder. 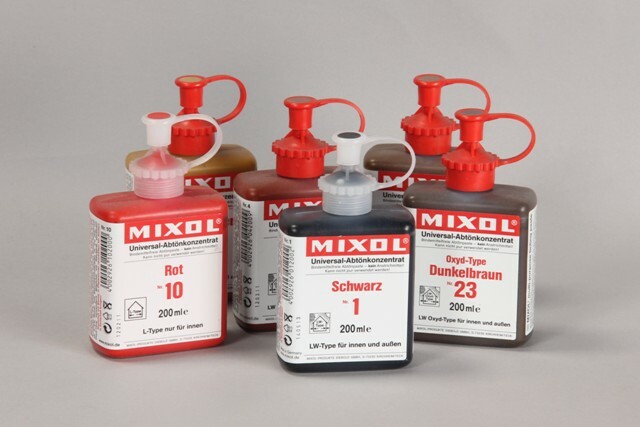 Made from quality pigments finely dispersed in a glycol ether carrier, they’ll mix with just about anything, including oils, varnishes, shellac, lacquer and water base finishes. For touch up work, we’ve found them first rate when used with shellac and they produce a smoother surface as compared to using dry pigments. Top coat any repaired area with shellac, aerosol lacquers, or water-base finish. 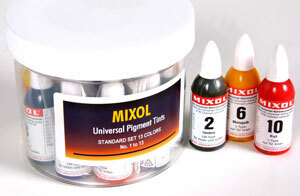 The kit colors are also useful for tinting glazes, stains, fillers, glues, and waxes. Contains 13 individual 20ml bottles of below designated colors. Packed in a plastic container. 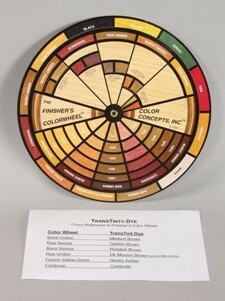 13 COLORS IN KIT: #1 Black, #2 Umber (raw), #3 Brown Oxide, #4 Oxide Red, #5 Yellow Oxide, #6 Maize Yellow (ochre color), #7 Canary Yellow, #8 Green (organic phthalo), #9 Blue, #10 Red, #11 Violet, #12 Fir Green, #25 White (titanium). These wax crayons are used for superficial damage where you replace color and fill at the same time. 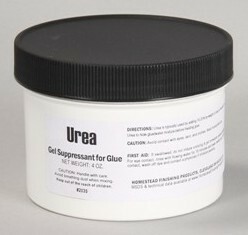 Use for filling small dents, gouges and nail holes. These crayons are found in every finishers repair kit and contain 10 popular colors so you can match any wood tone color. Colors can be intermixed to create custom shades. Housed in a handy tin for storage. 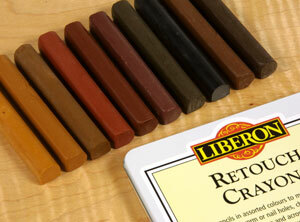 Just rub crayon into area and polish excess off with a soft cloth or a piece of folded paper. 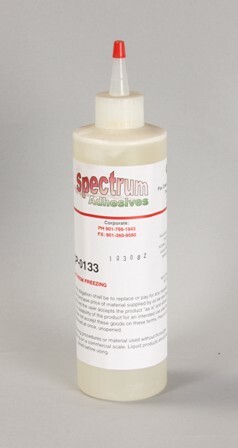 Our Hide Glue is the traditional glue sold in dry, granular form and is mixed with water to form a gelatin which is then heated to at least 140 degrees F. The gram strength of this glue is 192 which is best for all woodworking applications because it has a slightly longer open time than hide glues of a higher gram strength. Mix ratio is 1-3/4 to 1 (water to glue) by weight. 1 LB. PLASTIC JAR. 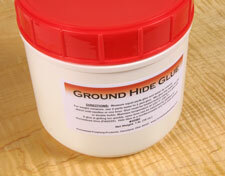 A dry powder additive for extending the open working time of hide glue (mixed from dry granules). Use 5% to 30% by weight. 4 OZ. PLASTIC JAR. 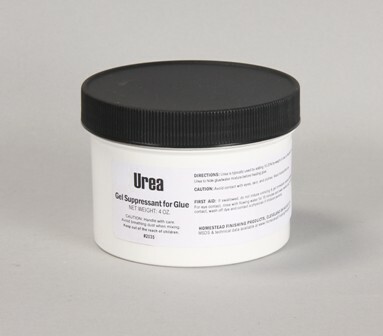 Finally – the best cyanoacrylate glue has arrived for guitar-making and repairing. This glue has a proprietary formulation which allows it to repair dings, dents and cracks in finishes with no witness lines. 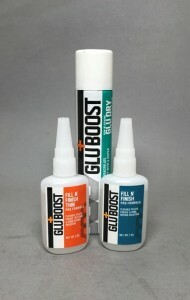 We have personally used this glue and can attest to it’s quality! 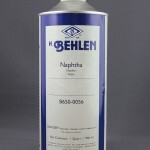 The Fill n’ Finish series is flexible and mainly used for repairs as well as creating a complete finish. The MasterGlu series is used for general construction as well as repairs. 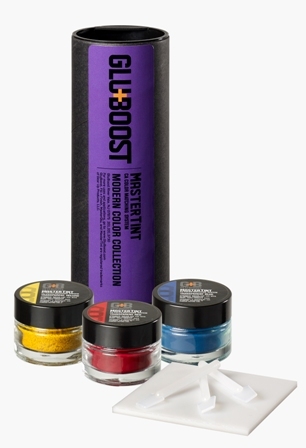 MasterTint are colorants specifically designed to tint any GluBoost product to do perfect repairs! Exclusive offers only on our eBay store here. 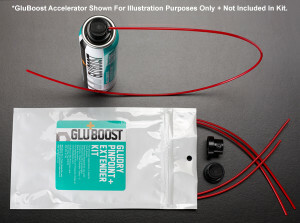 GluBoost – non-foaming accelerator for all GluBoost products – $14.00 – SHIPS FREE! 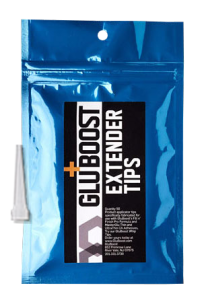 MasterGlu Thin – general purpose wicking grade CA Glue – $20.75 – SHIPS FREE! MasterGlu Ultra Thin – ultra thin viscosity version of above – $20.75 – SHIPS FREE! Fill n’ Finish Pro Formula – use for repairs of dings, dents and for use on porous woods – $20.75 – SHIPS FREE! Fill n’ Finish Thin Formula – thinner viscosity version of Pro Formula for repairs and a complete finish – $20.75 – SHIPS FREE! 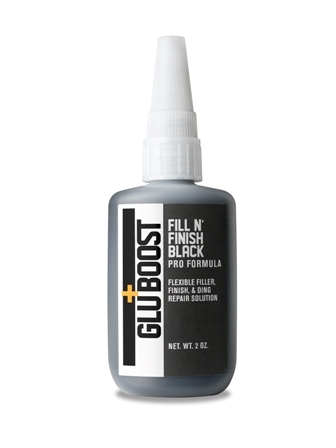 Fill n’ Finish Black Formula – created especially for blacks. Great for filling fret ends. – SHIPS FREE! 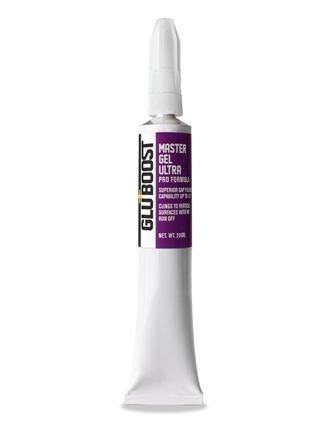 Fill n’ Finish Master Gel – extra thick viscosity – SHIPS FREE! MasterTint Vintage Kit – brown, yellow & amber tints, plus spatulas and mixing pallete – $55.00 – SHIPS FREE! 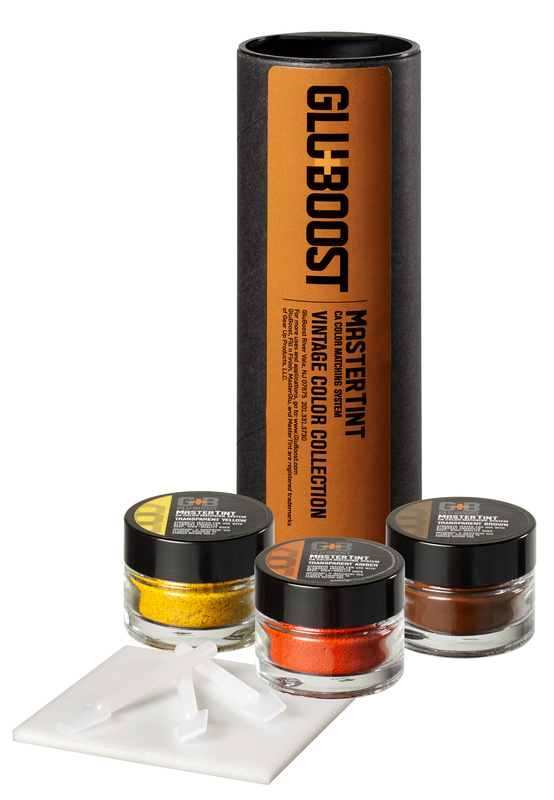 MasterTint Modern Kit – red, yellow & blue tints, plus spatulas and mixing pallete – $55.00 – SHIPS FREE! 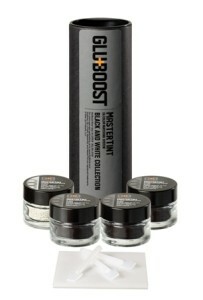 MasterTint Black & White Kit – 3 black and & white tints, plus spatulas and mixing pallete – $55.00 – SHIPS FREE! Extender Tips – bag of 50 extender tips – $28.00 – SHIPS FREE! 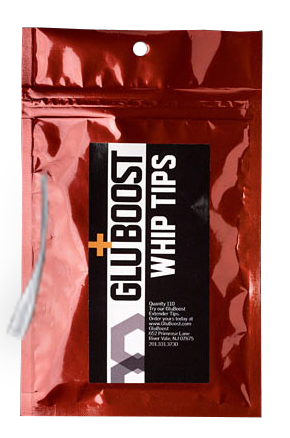 Whip Tips – bag of 110 whip tips – $39.99 – SHIPS FREE! Please Note: Aerosol products require ground shipment via USPS. This service takes longer and tracking doesn’t always get scanned. Please allow a little xtra time to receive your shipment. 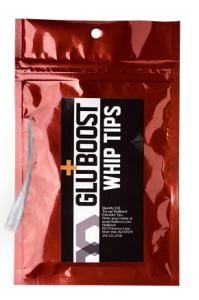 GluBoost Videos – see GluBoost in action here !! A very helpful guide that shows 60 color options and intensities. Shows the finisher how colors, i.e. Burnt Umber, Raw Sienna, Green, etc. can be intermixed to create custom shades. Also cross referenced to our line of TransTint® Liquid Dyes and Pigments. 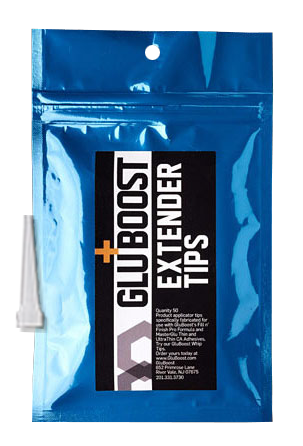 Glu-Size evens out uneven stain penetration to prevent splotching when using alcohol-soluble dyes. It is usually diluted 1:1 with water. Apply by spray, brush, rag, roller or sponge. Let dry 24 hours before subsequent finishing operations. Other uses for this product — when applied to fuzzy woods like mahogany & pine, it locks the fiber in place so that a smooth sanded surface results. It seals end grain to prevent it from darkening too much when using stain. When used on composite wood products like masonite and fiberboard, it seals the surface so that subsequent finishing products aren’t absorbed. On plywood, it will even out staining operations. This product is a real lifesaver! This impressive product won’t dry out or leave a residue that causes problems with water base finishes. 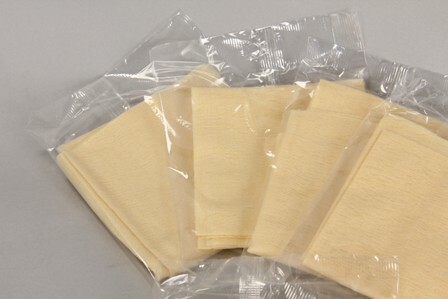 Made like standard tack cloths in a folded pad, but with a sticky synthetic resin instead of rosin. Individually folded and bagged, cloths measure 18″ x 36″ when opened. 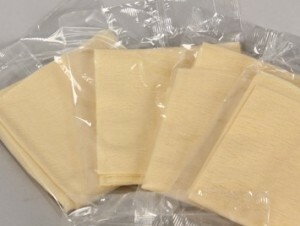 SOLD PER SINGLE SEALED BAG, PKG/10, OR CASE OF 100. 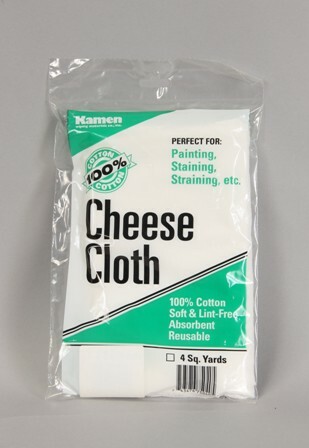 Our cheese cloth is 4 yd of a medium mesh cheesecloth. 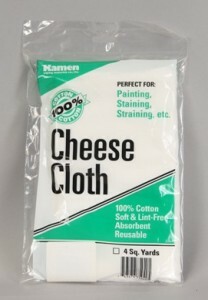 Used for straining, applying stains and polishing. Sold in packages of 4 sq. yard lengths. 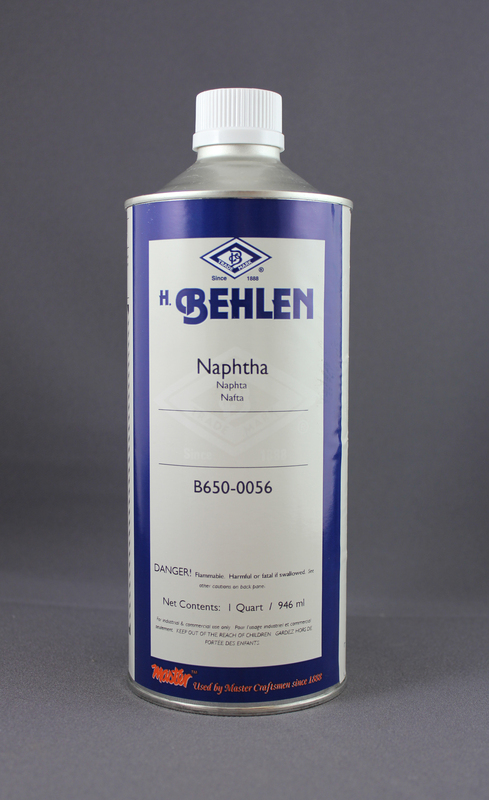 Naphtha is used for thinning of oil based products. It excels as a cleaner and removes, tape, gum, crayons and most marks from finished surfaces without damaging the finish. Dries faster than mineral spirits and paint thinner. QUART CAN.